It's finally here! A day I've long been awaiting. A day when little A will be sent off to school with a bag full of Valentine booty for all his little preschool mates to enjoy. Oh how I love Valentines. Hands down some of my favorite memories as a child were cutting doilies and red and pink construction paper hearts and applying them to a self-made mail/shoe boxes of sorts in preparation of the wonderful flood of cards and candy to be received by peers. When it was all over I'd sit in my room sorting through my loot, picking out which cards I liked best. I remember Garfield and Peanuts cards were usually on the top of the list. Oh what magical school memories (second only to the Halloween costume parades and cotton ball Santa beards). In honor of this momentous occasion little A and I have decided to share our Pirate Valentines with all of you. Simply download the boy and girl pirate sheets and get started. You can then print these onto white or colored card stock. 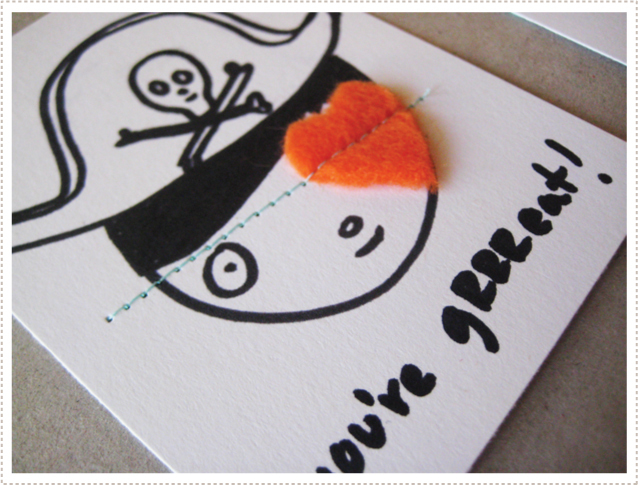 From there you simply cut out felt heart eye patches and then stitch across the paper, write a cute piratey saying such as "you're gRRReat!" and the front of the card is complete. You can get creative with the candy. Here little A and I did variations of gummy hearts sealed in sewn wax paper and lollies stitched right onto the back of the cards. Little A can hardly contain himself. He can't wait to dress up as a pirate and deliver his treasure to all his friends. He also can't wait to have a lolly, so I slipped a little card in his bag just for him, from mommy. Now all I need is a box (or two) of chocolates, conversation heart cookies and a night out with Jon and my V-day celebrations will be complete. i think i became more excited than a little kid when i saw these! definitely my favorite valentine i've seen and the fact that you are sharing them is amazing! thanks!!! Those are so full of awesomeness. Thanks for sharing! oh my goodness! i can't believe how cute they aaaarrrr! i don't think we get into it as much over here in Australia - at school anyway. i wish we did though! i think the adults get into it more here. then again, it's been a while since i was little A's age. I can't tell you how much I love these! Most adorable valentines anywhere. these are soo clever. I love it!! these are great! i'm sure he'll have the coolest cards at school! So cute! These are just what we needed. Thanks! Just discovered your blog and I am so excited. I love it!!! I love all the boy ideas since they are scarce. Oh and these cards are ridiculously cute. Is that a word? I'm so bummed my printer is not working right now. Arrrrr! Thanks for making our Valentines day! I was feeling bad I didn't have time to make anything with Dylan for his classmates, but we're going to do these tonight!! I just finished these, and they look awesome. My kindergartener will be so excited to hand out his little pirates out tomorrow. Thanks so much for sharing! 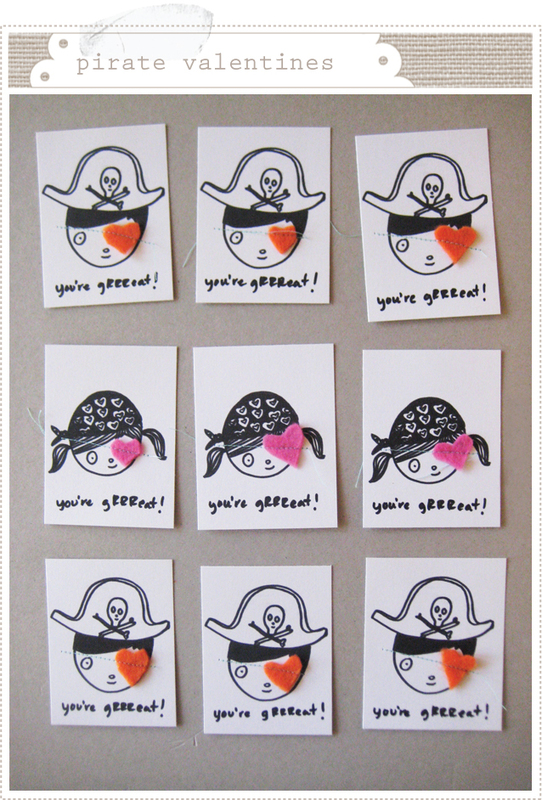 those pirate valentines are soooo fabulous! i love these! thanks for making it available to download! we'll use them next year! cutest ever! you do such a great job!!! xoxoxo! ps- my girls are crazy in love with your dolls. they've been to the store, the park & on a walk with them. and right now they're all sleeping with them. Courtney, I'm SO glad your girls love their dolls so!! That is truly the best feedback I can get. You'll have to take a pic of them with their little friends sometime for me :). i'm going to have to bookmark this in case we ever have a little one! my four year old son saw me look at these this morning through Crafty Crow and he exclaimed that this is what we wants to make this year! 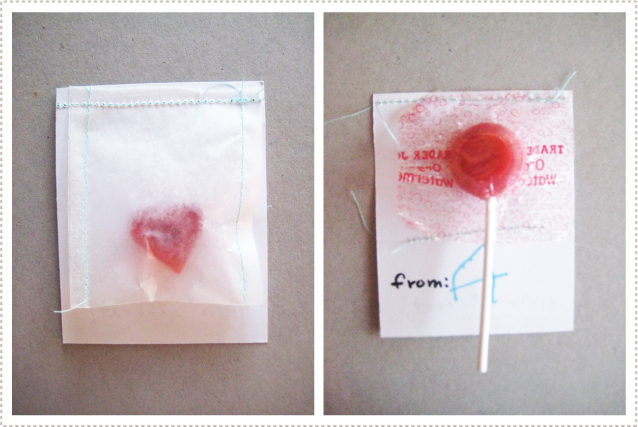 These are SO cute...and I love the sewn wax paper on the back with just a little piece of candy. Great job! oh i can't wait until my 2 yo son has a valentine's day party when he goes to school! i am def. bookmarking this! thanks! oh my gosh, these are adorable!!! thank you! These are great! I love the idea and am going to make my own version I think... our school mascot is a Pirate. How perfect!? I also gave you a shout out on my site. found you through Be Different, Act Normal. Very cool! Love the idea! My son is having his Pirate Birthday party this weekend. I think these will be a great follow-up for Valentine's! Thanks for sharing...these are awesome! My son wants to make his own Valentines cards this year . I was trying to think of some thing really cute and "boy-worthy" I think this would be g-arrrr-eat! Thank you for sharing such cute valentines. Many of our families at littlefoureyes.com have little kids that must patch one eye for vision therapy. I have linked to your post, as patching is tough and these little pirates make it look very cute! adorable! I love combining sewing and paper. thanks for sharing. I love these!I also wanted to let you know that I've added it to my link love today. These are grrrrreat! Thanks for sharing. Oh, these made me smile! Hope you don't mind if I link to them on my blog. Thanks for sharing them! just made 104 of these for my husband's church group--thanks a million! they are super fun. thanks again. I made these for my sons' valentines! so big thanks!! thanks for making these! they're sweet! Thank you for these! I made them for my daughter's class and they were soooo cute! These are super cute! I found the link on babble.com! So adorable! I'm glad I stumbled on your blog...it's adorable!! Thank you!! These are awesome. Perfect for my pirate-crazed daughter! We can't do food gifts in her class due to allergies so I think I'll make each of the kids a little felt heart eyepatch of their own to match the valentine. Thanks so much!!! Absolutely love these!! Just posted about it on Craft Gossip! Found picture on pinterest! visiting via a link from daily candy... :) LOVE this idea! thanks for sharing it! these are great! I shared this on our blog, Modern Hostess. Thanks for the printable...I just whipped these up for my 3-yr-old pirate-lover. Cute and so easy! You can attach the heart patches with a glue stick to make it even easier. I used glitter red and purple felt, tiny gold adhesive gems for earrings and gold teeth, and attached gold-foiled chocolate coins to the back in little plastic baggies, to make the pirate theme complete! A couple more message ideas: "I treasure your friendship, Valentine!" and "Arrrr you going to be my valentine!" Thanks for the inspiration. The kids in my daughter's class will love them! Thank you ! Love the pirates for my boys' friends. Thanks so much for the printable. We just finished making some for my daughter. She has to wear an eye patch sometimes to help her weak eye get stronger, so these are perfect. She's going to deliver her Valentines wearing her own pirate eye patch and pirate dress. Oh Polly I love your story and your darling daughter. Happy Valentines! Thank you so much for the printable. I sat down with my 5 yo daughter and 8 yo son and made valentines. I printed "You're grrreat! ", "I lurrrrve you!" and "You arrrrre sweet!" at the top of each. Printed them on pastel coloured cardstock. The kids signed their names, put a heart-shaped sticker on each and then I stapled an individually wrapped candy to the back. Thanks for creating something fun for us to make! oh man these are fab! so nice to meet you sat. I saw these when you first posted them - and I finally was able to use them this year! SO THANK YOU!! I'll link to you when I blog! great valentine! my 7-yr. old loves it! as we were short on time, we substituted the felt heart with a heart sticker which he and his almost 3-yr. old sister helped me with sticking on as the eyepatch. thank you! Arrrrggg... 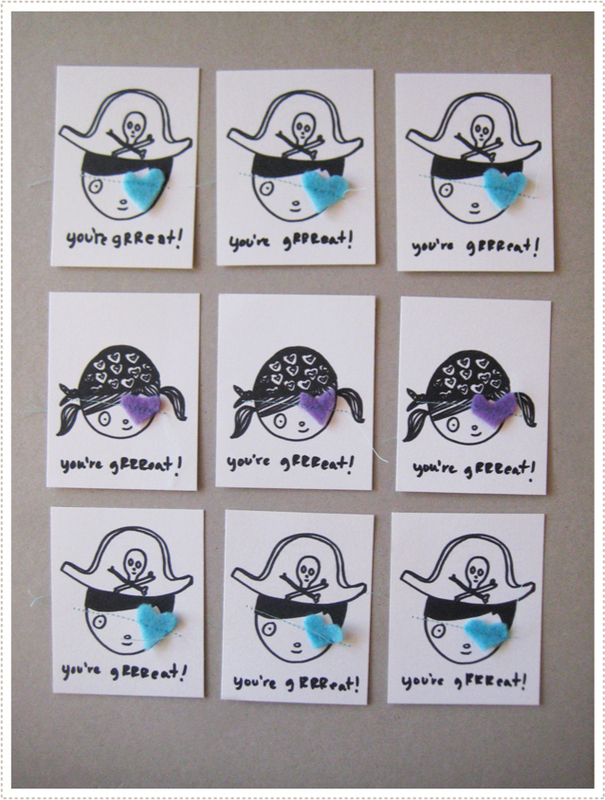 I really wanted to use these for thank you card for my kidlets pirate birthdays but the files are gone! I absolutely love these! I would love to use these this Valentines Day! Is there anyway to get a copy? I second the cuteness! These would be perfect for my pirate/beach themed classroom! Any chance of obtaining them? thanks! Love these pirate valentines! It seems that the file is gone! Any chance of getting it? I think these are really cute and would like to make them, however, when I click on the link the site tells me that "Mobil me" is closed and wants to take me to Icloud. Can you help? WOuld love to get a copy somehow!! Friends an updated link to the files is on it's way! I somehow lost the original files so thanks for your patience. The link needs to be fixed as it just takes you to the icloud home page. *Please* update the link. My daughter REALLY wants to make these for her class! ohmygoodness! I love these! Thanks for saving Valentine's Day! Thanks for sharing these. I'm going to make a whole class set of them and use them on a huge happy retirement poster/card for our school's principal!